In 1978, the Amoco Cadiz, a very large crude carrier, was on its way from the Persian Gulf to Rotterdam with a stop in Great Britain. During this stop the ship experienced very unsettled water due to unstable weather conditions. The morning of the stop, a very heavy wave crashed into the ship’s rudder. The rudder was damaged and efforts to repair it failed. The ship sent out messages stating that it was unable to move, but no one on the ship called for assistance from a tug until hours later. A German tug eventually responded to the call but the high seas made assistance difficult. A tow line was eventually attached, but it broke, and a successful line was not put on until 8:55 that night. In efforts to stop the drifting, the Amoco Cadiz dropped its anchor, but the strong winds and mass of the tanker were too strong. At about 9:00PM, the ship ran aground, which then caused the engines to flood, which then ripped the hull and allowed oil to escape. 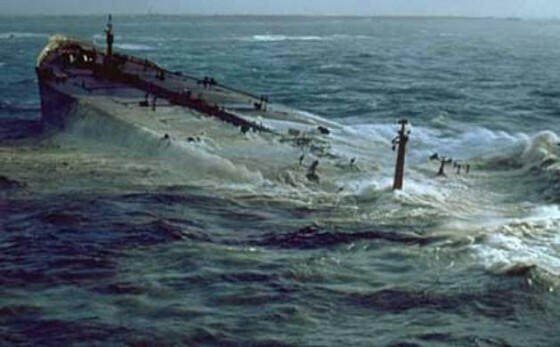 The next morning, the ship split in half and 69 million gallons of oil washed into the English Channel. Thankfully, everyone was rescued by French Naval Aviation troops, so no one died during the incident. Eventually the French Navy would sink the ship. 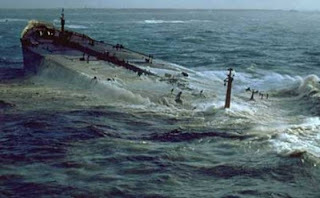 None of the oil was able to be pumped out of the tanker due to the horrible weather. The oil eventually reached beaches, 76 in total, and spread 200 miles along the coastline.